Getting a license for finance company registration in India is one of the most difficult tasks. This is because with finance word added with your company name, every person will see you suspiciously as in you are doing some fraud or fooling people with unwanted schemes. Further even the government looks at you suspiciously and hence does not grant the finance license so easily. To know why people look at the finance business suspiciously, one needs to go through the history of finance companies in the 90’s when everyone was doing the finance business and fooling people around and doing fraud of crore of rupees. 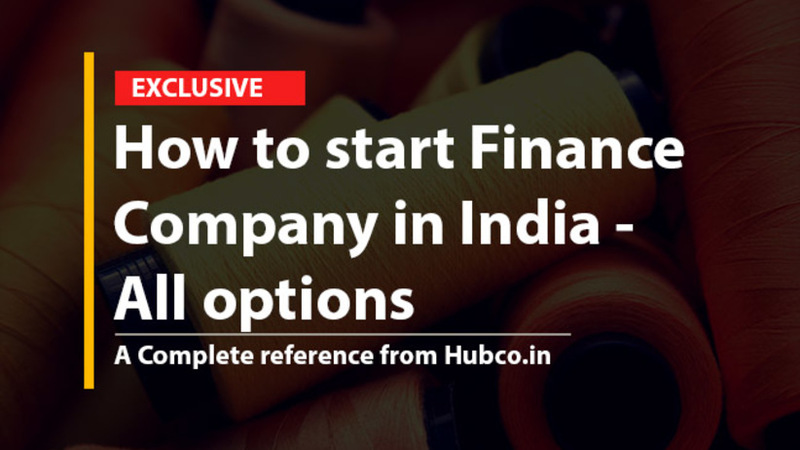 With this entire brief introduction, let us understand how one can start a finance company in India and what the best possible options one can avail. Let us discuss each option in brief and the best option in detail. In India, to register an NBFC’s are governed by the Reserve Bank of India (RBI) and require a minimum capital of Rs.2 crore (5 crores in case of micro finance) to start with. Further getting the RBI license is a huge task and takes almost 5 to 6 months to gets the complete procedure done. Also, there is no guarantee that RBI will grant you the finance license. Can accept foreign investment up to certain limit. Trust and societies are one of the famous forms of finance business in India. Anyone who wants to start a finance business at a shorter level i.e. at the district level, this is the best option for them. However, now a day’s getting the society license is also getting difficult day by day and registrars of society now does not issue the societies license in the wake of frauds going on. Can be registered with less registration cost. Ownership can be changed with the election. Nidhi Company’s registration is one of the best and the easiest option to start your finance business in India. Nidhi Company can be started with 5 lakh capital and can be registered in 15 to 20 days. Under this option, one can accept deposit and grant loan. Minimum capital of Rs.5 lakh: A Nidhi companies can be started with a minimum capital of Rs.5 lakh and in a span of a year, the same needs to be raised to 10 lakh. A minimum person required: To start a Nidhi Company in India, a minimum of 7 persons are required out of which 3 people are elected as a director of the company. Rent agreement (in case premises are registered). The Nidhi Company registration can be divided into 4 simple steps. However, before going forwards, one needs to understand about the license of Nidhi Company. Nidhi Companies are the special type of entity which is governed by Nidhi Rules, 2014 and does not require separate license to start the finance business. Arrange documents and apply for Digital Signature: The first step in Nidhi Company registration is to arrange documents and apply for digital signatures for all seven people. Apply for three DINS: Once the digital signatures are done, you need to apply for three DINS. DIN is identified as Director Identification Number (DIN) and as per law, every director must have it. Get the Nidhi Company Name approved: Once you are ready with the Name approval, the next thing you need to do is to get the name approved from the Ministry of Corporate Affairs (MCA). Once approval is granted, the next step is to apply for the incorporation. Apply for Nidhi Company incorporation: Once the name is approved, we can move to the final stage for Nidhi company registration. Under this stage, all the documents are prepared and then filed to the MCA. If the documents are ok, then MCA shall grant us the GST registration certificate. Though this route is also very famous, companies are not getting approval for this type for an unknown reason. Technically and legally, the Micro finance companies can also be registered without RBI approval. However, due to unknown reasons, the MCA is not approving the company. Therefore, if you want to start the company in India, then chooses Nidhi Company instead of Micro Finance Company. Producer Companies are the companies suited for farmers or producers. It requires atleast 10 people to start with. This option is just like the Nidhi Company, however, the Nidhi Company offers more flexibility. Some of the states offer the local finance license to start the finance business in the state or rather district. The state of Kerala and Maharashtra generally offers the state finance license. We have tried to explain you the types of finance companies option in Delhi and also explained to you that why Nidhi Companies are most famous option nowadays. Therefore, if you want to start the Nidhi company, then please contact us or email us at info@hubco.in.